Long ago and far away the world experienced an innovative (and some would say, scandalous) sound from a British band….. The Beatles. It’s hard to believe the year 2014 marks the 50th anniversary of the Beatles first landing on the shores of the USA..but having the RAIN show back at the Hershey Theatre seems a fitting tribute. 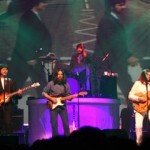 The ensemble performs a full range of the Beatles music, including complex and challenging songs the group recorded in studio but never presented on stage. Updated sets, new LED, High-Def screens and new songs are all part of the 2014 tour. Some of the works you can expect to experience are “I Want To Hold Your Hand”, “Let It Be”, “Hey Jude”, “Come Together” and “Hard Day’s Night”. Be a part of the sixties scene once more and enjoy a memory-filled evening.